I am not sure when I ovulated last week. I'm going by my cervical mucus; therefore I believe it happened between March 7th and 12th. I'm betting the 10th. Well, I have had heartburn and acid reflux which I never get. On the 12th, I felt so sick, I thought I was going to through up. Since the 8th, I have had vivid dreams every night since. 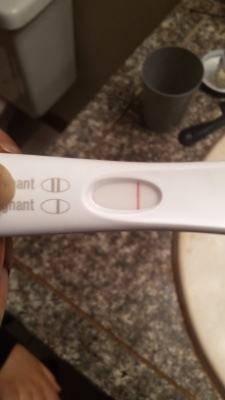 I took a FRER days sooner this past Sunday and there was what I think was a very faint line. I took a few Dollar tree tests and You have to squint to see something. Well, yesterday, I took an Equate Digital and it said NOT PREGNANT. I tested with the Equate Digital again this morning with FMU and another NOT PREGNANT. Was the FRER just an indent line or did I test to early? With my son, I tested positive at 7dpo. Does it vary every pregnancy with how soon you can get a positive. NEED ANSWERS, PLEASE! Test again in few days. In not sure if its an indent or faint line either. May be too early. No side breasts pain after ovulation, but high bbt. Good sign? Ultrasound showed thick lining, but negative HPTS and 3 weeks late AF, could I still be pregnant?